This week I have a Swell boat for you. The Nautilus Swell that is. I saw her while walking the pier in Steveston BC, one of my favourite working boat harbours. Her classic lines first caught my eye, then I was taken by her pristine condition. I went online and found out that the Nautilus Swell is a live-aboard scuba dive tour boat for 14 guests that cruises the waters of British Columbia and Alaska. Some of the trip stories were pretty amazing. Tours run from 8 to 11 days, depending on the destination. Last December I mulched my potted plants to help them survive the winter cold. I used crumpled newspaper to give the surface of the soil an uneven cover, hopefully creating air pockets to keep the soil, roots, and stems from freezing. I then covered the paper with soil to keep it in place. Here are the results. The first test was my ornamental grass and geraniums in my repurposed BBQ planter. It wasn't a total failure. My ornamental grass is doing well, but the geraniums didn't produce any new growth. I hated to give up on them, so I put the root balls in another pot just in case I wasn't patient enough. To take their place, I purchased four new geraniums to start filling in the blank space. In March when I uncovered the rhubarb roots, a few sprouts were already appearing. It didn't look too promising, but I went ahead and dug in some new compost and added some multipurpose plant food. Last time I went to the Economy Shop, I found another treasure. For just 50 cents, I got a $14.95 book called Ruffles on my Longjohns by Isabel Edwards. 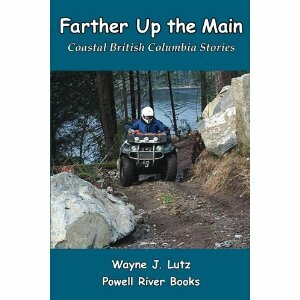 When Wayne and I first discovered Powell River, we started reading regional books. One was about an early homesteader near Bella Coola, Ralph Edwards of Lonesome Lake. In 1913, Ralph homesteaded on a remote lake in the Coast Range. His brother Earle came to stay and also fell in love with the region. In 1932, Earle and his wife Isabel were living in the bustling city of Portland. Earle was experienced in the ways of the wilderness. Isabel was what Wayne and I called ourselves, "cityfolk." But like us, she was open to new experiences. Earle proposed a Christmas visit to his brother's homestead. In those days, it was no easy trip. They drove a Studebaker coupe on what were loosely called roads to Charlotte Lake. From there, they built a raft and sailed its length. And that wasn't the end. They hiked over the mountains following fast running rivers down to Lonesome Lake. After a lengthy visit with the Edwards family, Earle and Isabel decided to stay. 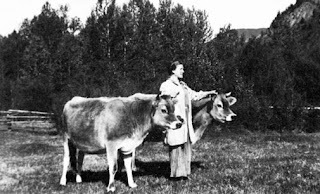 Ruffles on my Longjohns is Isabel's account of learning to live on a remote homestead of her own, building a rewarding life in the wilderness at Atnarko, then on a farm closer to Bella Coola in Firvale. Isabel was a amazing woman living and holding her own in a world dominated by men. She learned how to fish, cook, can, care for animals, and run a home with few resources. Their Christmas trip turned into a lifetime of hard, but rewarding work and play. 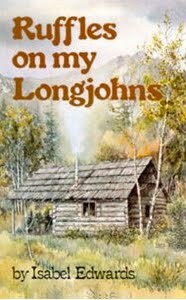 Find a copy for yourself, and enjoy a true account of British Columbia history. 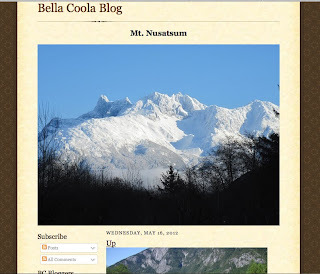 Wayne and I went to Bella Coola once in our airplane. We didn't get to venture very far into the interior, but what we saw was beautiful. But I can imagine the winters are much harder than on the lower mainland coast. John got a new nickname, John Cougar Mellencamp. Well, maybe just John Cougar. Last week Wayne and John went out hiking. While traveling through a logging slash, they had a scary cougar encounter. Wayne was in front, John's dog Bro was in the middle, and John was bringing up the rear. John has tremendous hearing. 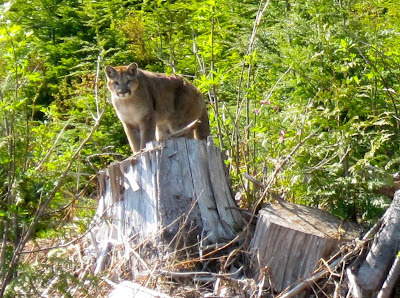 Even though the cougar ran almost silently through the brush, John turned in time to see it bearing down on them. He yelled, waved his walking stick, and grabbed Bro by the neck. The cougar probably though Bro looked like a tasty morsel. 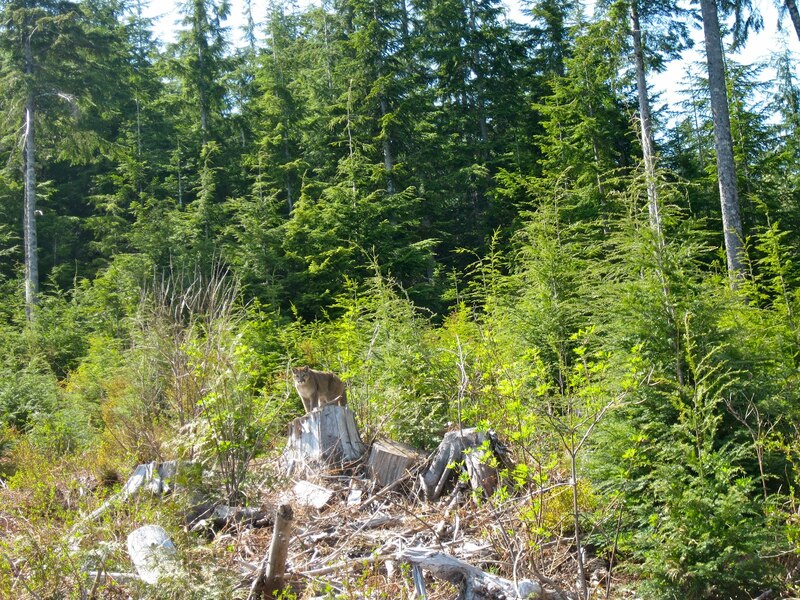 Just before reaching the guys, the cougar veered off into the bush. 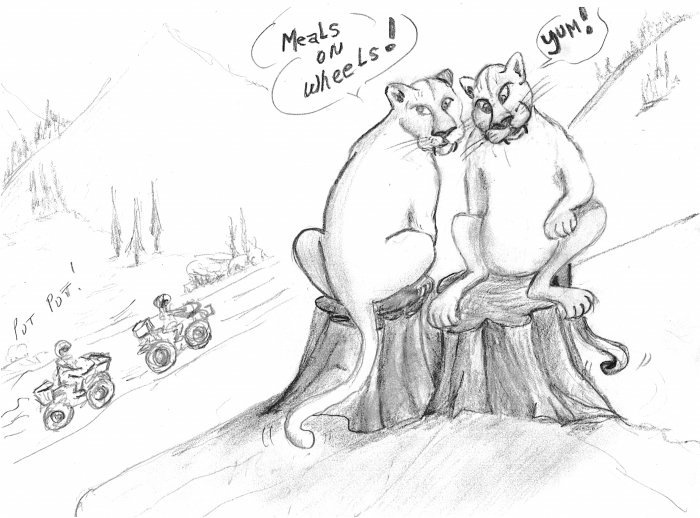 Later they looked over their shoulders, and the hungry looking cougar was still there on a stump watching intently. Spring is a nice time to be up the lake. One day it's cool and rainy, perfect for a warm fire in the woodstove. The next day it's sunny and warm enough for a sunbath on the deck. And on a calm day, it's beautiful to go out boating. I love the way a wake leads your eye right up to the sky. 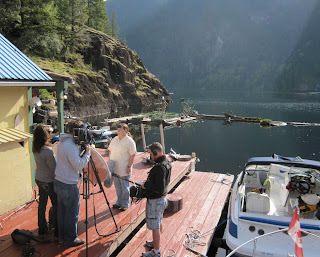 About a year ago, I heard from a producer for a Travel Channel show called "Extreme Houseboats." We talked on the phone and I explain a float cabin was quite different from a houseboat. It's built on a log float rather than a hull, and has a permanent location rather than a motor. 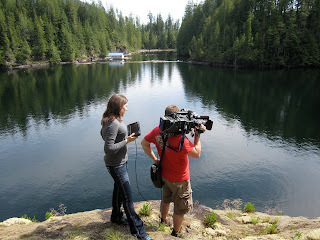 I also explained we were on a remote lake in Coastal BC. Not unexpectedly, the producer called back to say they would "keep me in mind." I figured that was it. Then suddenly last month I got another call to schedule a filming date for an international segment of "Extreme Houseboats." 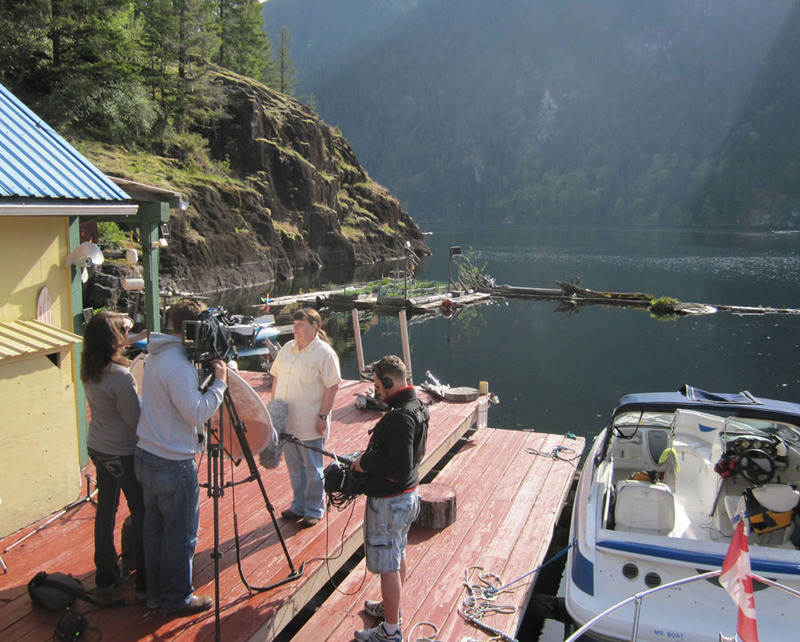 Nina Giannelli of Powderhouse Productions in Massachusetts made all the arrangements to tell the story of float cabin living on Powell Lake. What an experience! We all met at Vancouver Airport and flew to Powell River together. After looking at their baggage, we decided to bring two boats to the Shinglemill the next morning to bring them up the lake. Nina brought a freelance Canadian film crew with her. Mark Barry, the sound mixer, followed us with his large "shaggy dog" mike. Chris Bedyk had cameras large and small to capture float cabin living in all its glory. Of course, they were intrigued with my floating garden. And Wayne's boat called Gemini that's converted into a writer's retreat was also a hit. 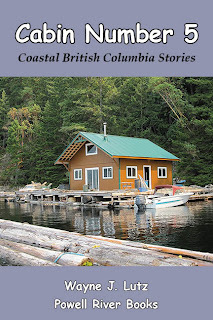 Nina had two of the Coastal BC Stories books to read before coming to met us. 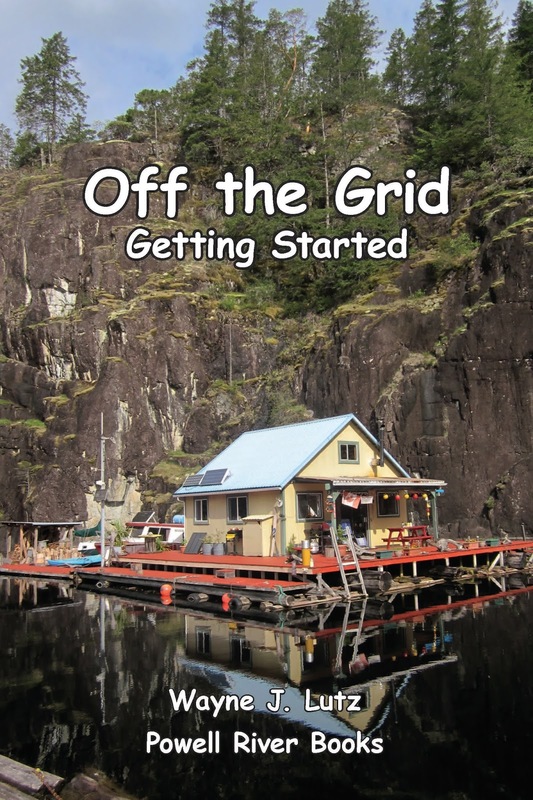 That way she could get a feel for what off-the-grid living is like. 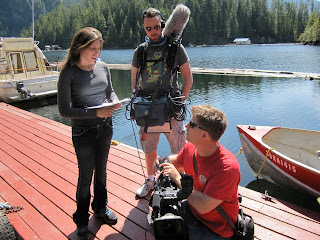 All three members of the crew enjoyed their visit to Powell River and our cabin home. We don't know when the show will be televised, probably several months from now. I'll keep you all posted. This spring I planted my floating garden in mid-March. It was a little early, and we had quite a few cool rainy days, but the sunshine last week was a real boost. Everything is becoming well established, and a few things are ready for an early harvest. My asparagus has been in the ground several years. This year we are being rewarded with spears that are almost store-bought size. We can continue harvesting through mid-June. Then I'll let them go to fern to replenish for next year. As you can see, I already have my support structure in place ready to go. This year I'm trying yellow onion sets. I'm really pleased so far. The bulbs have already doubled in size, and the green tops are perfect for salads. 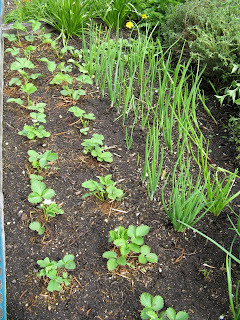 I also planted bunching onions. An advantage is they continue to produce even as you harvest. My spinach is coming along, and the new strawberries are well rooted. Another early treat was rhubarb. This is the third year for my plants, so they are starting to produce nice large stems. We made some stewed strawberries (store bought) and rhubarb with whipped cream for dessert. Yum! While Wayne and I were up at the cabin, we had unexpected neighbours. A Powell River based hunting guide was using the cabin next door as headquarter for a black bear hunt for some visiting Texans. Now that's a long way to come for a trophy. One of the down sides to a long, cool spring is a nearly depleted woodshed. Looking forward to a few more weeks of woodstove use, we went on a last minute spring wood hunt. Floating wood takes a while to dry enough to burn. We decided to find some wood along the shoreline that already had a head start. We only took enough to fit in the tin boat. That's enough for now, plus it was enough for our energy level and my hand's endurance so soon after surgery. With the load balanced fore and aft, we headed home. The wood will still need a little drying time, but hopefully the sun predicted for the next week will help. One advantage of bringing the wood back already cut is that it could be tossed right from the boat into the floating woodshed, then neatly stacked for maximum sun exposure. 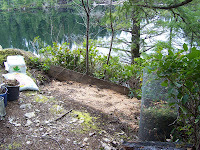 This is a post reprint for May 6-12 International Compost Awareness Week. This important educational program is sponsored by the US Composting Council, with the theme of Compost! …Replenish the Earth for Generations, and supported by the Compost Council of Canada, with the theme of Give Back to the Earth … COMPOST! No, not mud pies. I'm trying to use the power of the sun to help me rid the potting soil from my potato barrel of pests, primarily slug eggs and some small wriggling worms which probably were potato tuberworms. I don't remember seeing any slugs on my potato plants, but there are definitely eggs visible in the soil. The worms are no longer visible, but I'm sure there are eggs still waiting to hatch. Solarization is the process of using the power of the sun to sterilize soil. It's best done during hot summer months, but at least one website stated that it is somewhat effective during cooler months. It's worth a try. In most cases, soil in garden beds is covered with plastic tarps for 4-6 weeks during summer heat, longer in fall and winter. 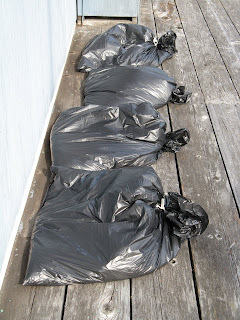 I removed the potting mix from the potato barrel and divided it into four plastic garbage bags. To speed things up, I picked out as many slug eggs as I could find. First, I left the bags open to partially dry the soil. Then, I sealed them to start the "baking" process. The soil in each bag was about four inches deep. Also, in a closed environment the heating potential is increased. This will be particularly important now that fall has arrived. Every morning we make a pot of coffee, so we have lots of coffee grounds. In spring and summer, I put them directly into the garden. In winter, I "cook" them dry in a frying pan on the wood stove. That way they store in Ziploc bags without moulding. In the garden, coffee grounds have many uses including mulching, composting and pest control. Coffee grounds are high in nitrogen and that makes them good for fast-growing vegetables like tomatoes. One article said they also help prevent blight. What really interests me is deterring and killing slugs. While I don't think using grounds has solved my slug problem, I think it has helped reduce the damage to my strawberry plants. Now that my garden's in, I want to keep it healthy. One of my major problems is slugs. They thrive in dark moist corners and come out to munch on my lettuce and juicy red strawberries. 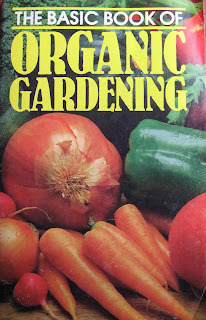 I have several organic gardening books, but the best is a pamphlet called The Basic Book of Organic Gardening (1988) by Rodale Press of Emmaus PA. I found it for $2.00 in a used book store, but it's value is much more! It includes a list of the "Terrible 26" pests with organic solutions for their control, tips on composting, and organic materials you can use to enrich garden soil. I'm always pulling it off my shelf to make gardening decisions. One of their solutions for slugs and snails is crushed egg shells. It seems that their soft bodies can't take crawling over sharp objects like egg shells. Now that I've planted my new bareroot strawberries, I don't want to share their fruits with the hungry little buggers. Each time Wayne and I have eggs for breakfast, I wash the shells and put them in a plastic basket to dry. This makes them easier to crush with nice sharp edges. After the shells are dry, I put them in a plastic bag, zip it shut, and apply pressure to crush them. I leave the pieces large enough to have lots of rough edges to discourage those soft little tummies from crossing over. And those persistent enough to try scrape their bellies and die from dehydration. Not a very pleasant thought, but it's a necessary evil. I started with a section of berries that looked like they would be early producers. If I can discourage the slugs from taking up residence, maybe the developing berries will have a better chance. Plus, the garden gets the added benefit of calcium as the shells decompose. A win-win, except for the poor slugs I guess. Hey Wayne, what do you want for breakfast? How about eggs? We've still got one and a half strawberry beds to go. Eat up!! Last fall I placed the clippings from my garden in a hole I dug in my hillside potato patch. 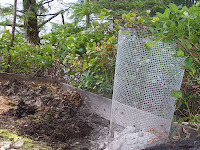 For the first time, I used a compost accelerator called Rot-It to help the tougher stems (like strawberries) decompose by spring. After the first layer of trimmings, I sprinkled on some Rot-It and then gave it a good watering. Then came another layer with the same treatment, and then a third layer with more Rot-It and water. The moisture helps accelerate the composting process. I covered the mound with the dirt from the hole and gave it all a final watering. Once everything was nice and moist, I covered the mound with two large plastic trash bags opened flat to help hold the moisture in, and generate some heat to break things down. To keep the bags in place, I placed boards on top. And there it sat until last week. When I uncovered the mound and dug through the pile, it was completely decomposed. Beautiful dark, rich soil just perfect for my potato patch. Wayne volunteered to help me dig in a bag of steer manure. Now I'll let it rest until next month before I plant my potatoes. I have a few Yukon Golds left over from my pots, and some sprouted Norland reds from last year's crop. 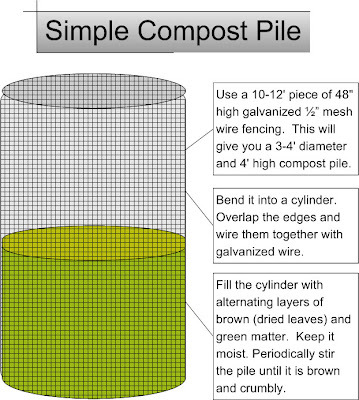 When I started composting my kitchen and garden waste, I knew I wanted a simple compost pile. Here is the one I made from galvanized wire mesh fencing. I sits in the corner of my garden. From spring through fall, I add both kitchen and garden waste to the pile. I cut the garden waste with tough stems into smaller pieces before it goes into the pile. During winter, I only add kitchen waste and occasionally ashes from my Kozi woodburning stove. I stir these in to make sure they decompose before spring planting time arrives. 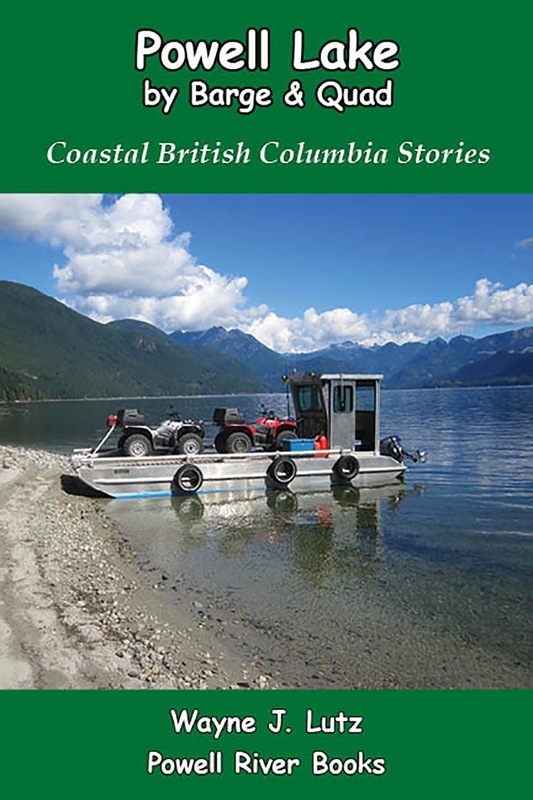 In Coastal British Columbia, keeping the pile moist isn’t much of a problem. In warm summer months, I give it a watering at the same time I water my garden. Each year I am rewarded with rich soil to add to my garden. Because this garden is located on a rocky outcropping, this is a wonderful benefit. Otherwise, I would have to carry commercial topsoil up four flights of stairs. Now that’s what I call beneficial soil! Here are the directions if you would like to make one for your own garden.